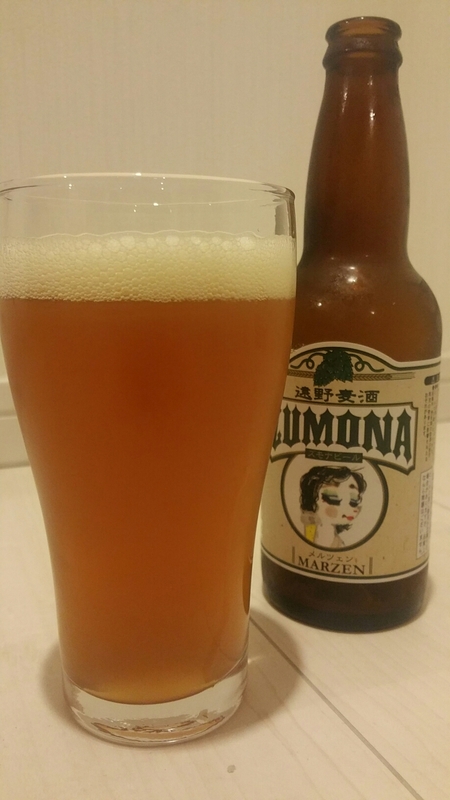 Zumona Marzen is a 5.5% märzen style beer from Tono Zumona Beer, based in Iwate prefecture. It could also be classified as an Oktoberfest style beer as well though the two styles are pretty similar in style and when they’re traditionally brewed (for those wondering, March which in German is März). Though this style of beer is relatively new to the Japanese craft beer scene, Zumona Marzen has been in brew for a few years now and is on sale from Autumn onwards while stocks last. Oktoberfest beer is here. A bit late, but it’s here. This was a beer that almost got forgotten – I was sitting down on the floor, with a cold beer watching a movie when it dawned on me, I hadn’t taken its picture yet. Out came the camera and boom, picture done. Safe. By that time though, the head had gone down and I had drank some Zumona Marzen already so this was the second bottle immediately after the first. It poured out a deep golden amber colour, that resembled honey really though there was a fair amount of haze on the beer. It had a wheaty bready smell to it along with some roasted grainy smell to it as well. It was a malt forward beer with no bitterness at all. Zumona Marzen’s taste followed the aroma pretty well with a high malt profile which produced a caramel sweetness to it that was far stronger than other märzens I’ve had. The most peculiar thing about it was the taste of bananas that came through during the second tasting. Perhaps I ignored it in the primary tasting but this was most peculiar. For those who dislike hop bitterness then Zumona Marzen could be for you as there was not bitterness to it at all. It finished off with a lingering dry and sweet taste to it. Zumona Marzen is a good example of a märzen beer but that banana in the body just felt out of place.